Nobody is excited to get a root canal. People do not line up outside dental offices worldwide, eager to get a taste of that root canal life. However, if you have an infected tooth, a root canal by an experienced endodontist is a needed and necessary procedure to help save a tooth from being permanently removed. The endodontist at University Dental Family Dentistry & Orthodontics specializes in root canals, making us the right choice for a root canal procedure in San Diego. What is a Root Canal and When is a Root Canal Needed? A root canal is a procedure that is needed when there is an infection deep within the pulp of the tooth. The pulp can become infected with bacteria as a result of either an injury or an untreated cavity. If a root canal is not performed by an endodontist on the infected tooth, the infection can grow to the point that the tooth must be completely removed. What are the Signs & Symptoms of Needing a Root Canal? If you have an infected tooth that is in need of a root canal, in most cases you will have a few clear symptoms. The tooth will be overly sensitive to heat and cold, as well as tender when chewing or even to the touch. There will also be prolonged pain, slight tooth discoloration, and possibly issues with nearby gum tissue and bones. In some cases, no symptoms will be present, which is just another reason why getting a regular dental exam is so important. Dr. Hage is the endodontist on staff at University Dental, providing the best root canal treatment in San Diego. You want an experienced endodontist you can trust to perform a root canal procedure on your teeth, and Dr. Hage will not disappoint. He is on the cutting-edge of the latest root canal treatment methods and will answer any and all questions you have regarding the procedure. If you are looking for a great endodontist in San Diego, look no further than Dr. Hage at University Dental. When you arrive at University Dental, your endodontist, Dr. Hage, will greet you and answer any last minute questions about the procedure. The first thing Dr. Hage will do is administer a local anesthesia to numb the tooth and dull any pain. The endodontist will then place a dental rubber dam to isolate your tooth, allowing them to more easily perform a root canal on the tooth. Next, the endodontist will use a small drill to open a small hole in the top of the tooth, allowing access for the removal of infected or necrotic dental pulp. Once inside, the endodontist will use a microscope to thoroughly clean the canals and remove the infected pulp from inside the tooth. Once the pulp is removed, the endodontist will use specialized instruments to shape your canals. 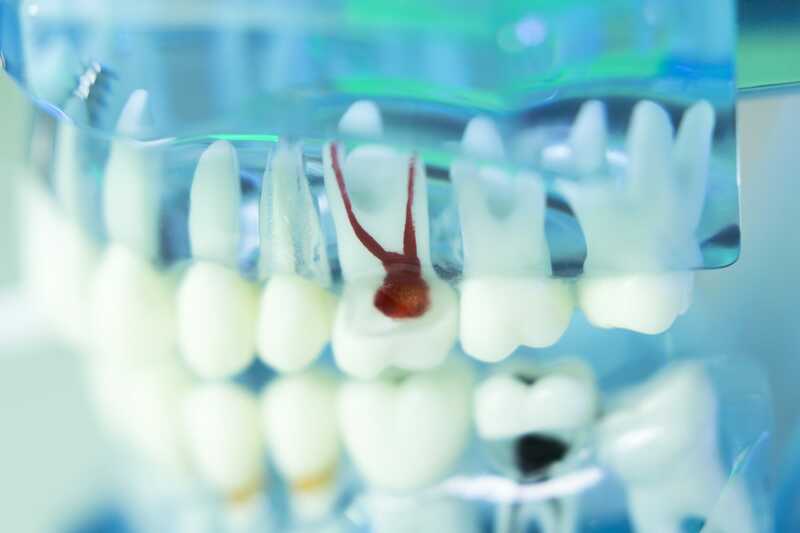 Now that the tooth is clean, the endodontist will fill the roots of your teeth with a biocompatible filling material. A temporary filling will then be placed by the endodontist over the access opening to protect your roots from being exposed or contaminated until you return to your general dentist for your final restoration. University Dental is the local root canal expert in San Diego, with endodontists on staff with years of experience with root canals. We have the best endodontist in San Diego with years of experience performing root canals. If you have an infected or damaged tooth that needs treatment, contact University Dental. We will exam the tooth, perform x-rays and determine the best course of action to get your teeth healthy and clean. If you are interested in learning more or would like to schedule an appointment today by calling (619) 582-4224. University Dental is the local root canal expert in San Diego, with endodontists on staff with years of experience with root canals. If you have an infected or damaged tooth that needs treatment, contact University Dental. We will exam the tooth, perform x-rays and determine the best course of action. Schedule an appointment today by calling (619) 582-4224.